This cabinet card photograph features a lovely group of siblings posing at the Reynolds studio in Nevada, Iowa. The children are nicely dressed. They are not members of a poor family. Preliminary research did not identify any biographical information about the photographer, However, the cabinet card gallery does exhibit another cabinet card image from a photographer in Iowa. J. H. Reynolds was a photographer who operated out of Burlington, Iowa. Perhaps he also had a studio in Nevada. This cabinet card portrait is in very good condition (see scans). 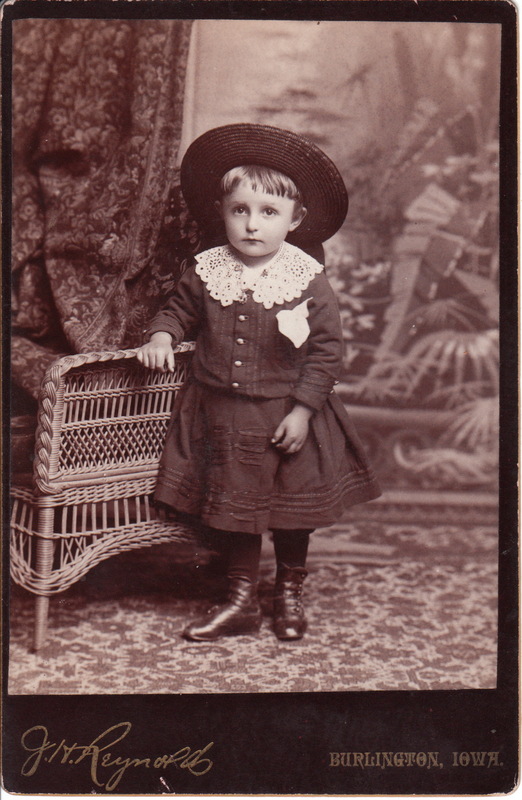 A REAL CUTIE PIE, BOY OR GIRL IS UNCERTAIN BUT I VOTE FOR GIRL NICE HAT AND BUTTON UP BOOTS J H REYNOLDS IS PHOTOGRAPHER JH REYNOLDS PHOTOGRAPHIC STUDIO IS WAY ITS WRITTEN BANGS LACE COLLAR STRAW HAT?